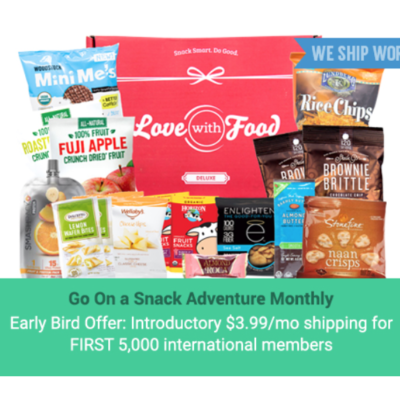 Love with Food is a fun snack discovery subscription available in three versions: classic tasting box, deluxe/family size, and gluten-free. This is the Deluxe Box, but you can see our reviews of the other versions too. 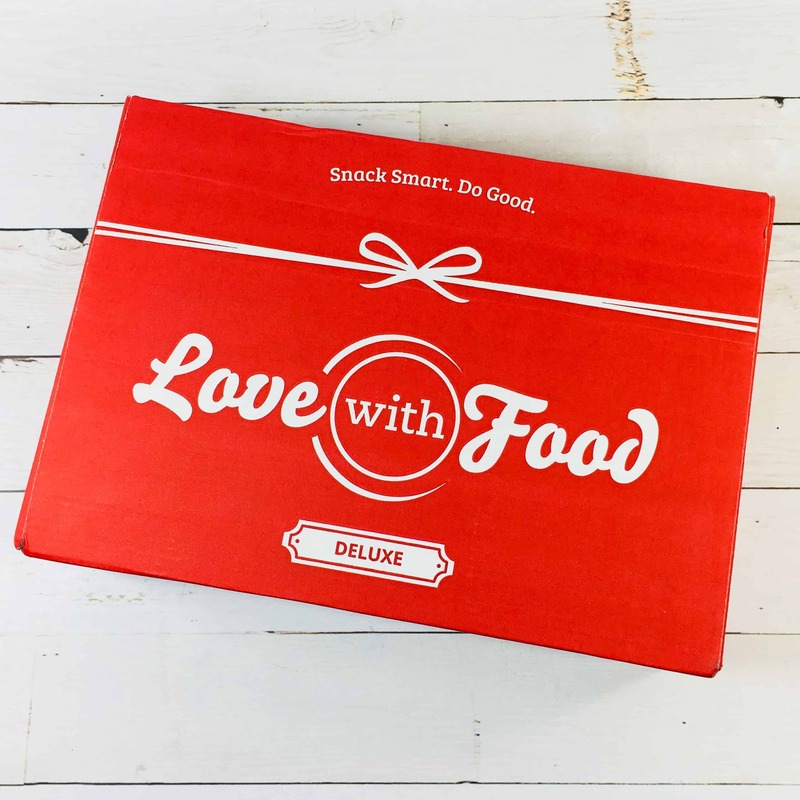 DEAL: You can try Love With Food by using this link to get 25% off your first Deluxe Box or get your first Tasting Box for $7.99. 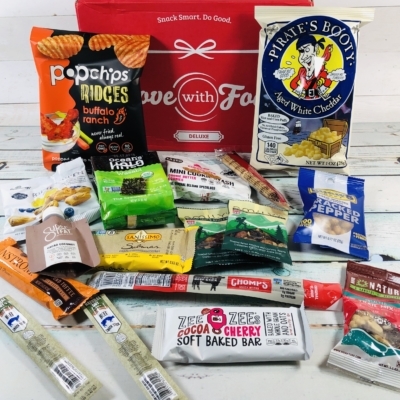 You can also save 25% on your first Gluten-Free box by using this link. 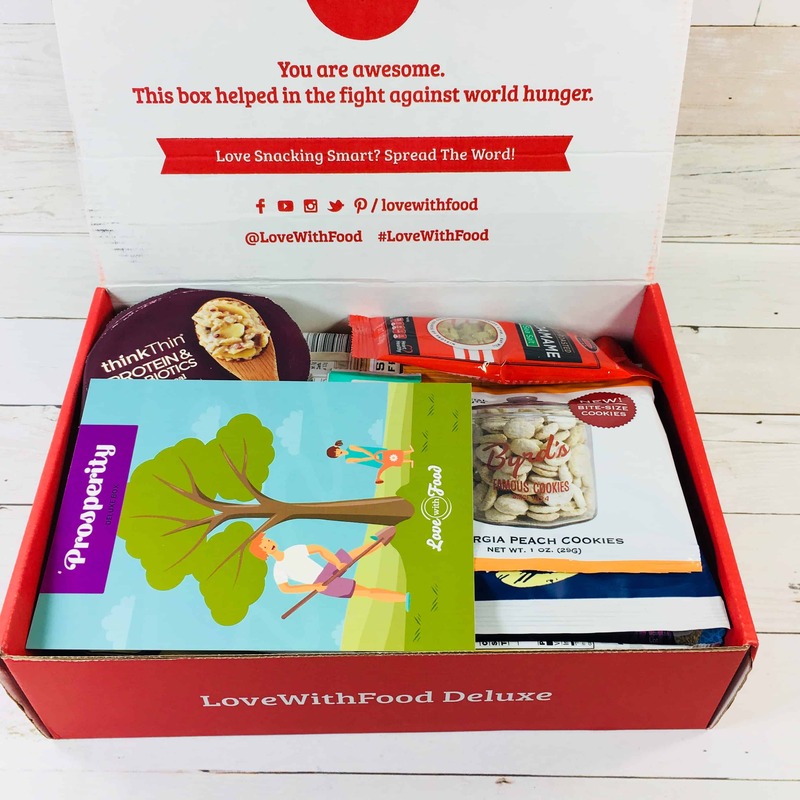 As always, Love With Food donates meals to charity with each box purchased. 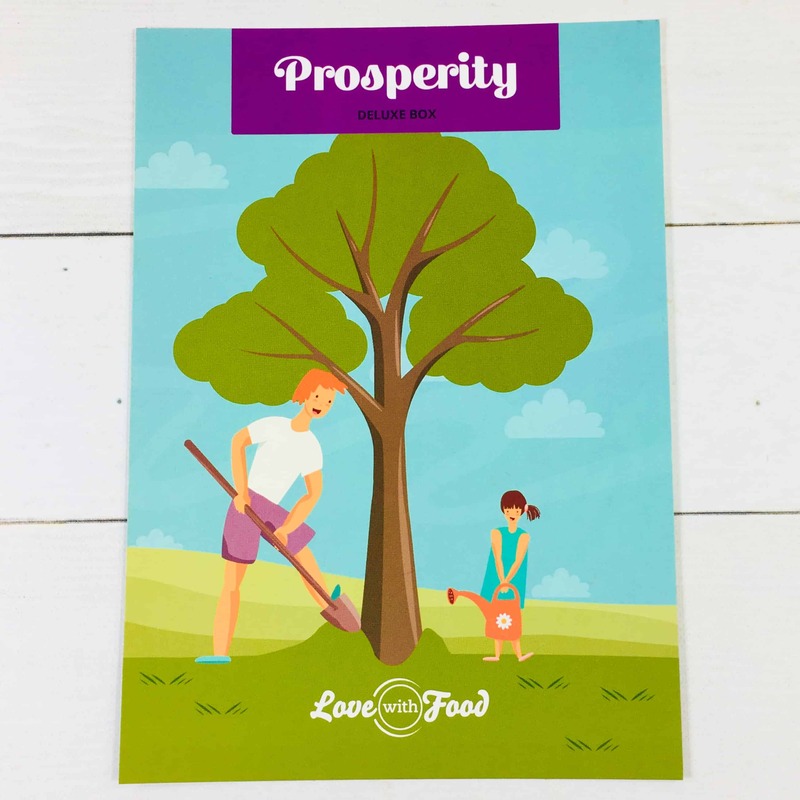 This month’s theme for Love With Food is PROSPERITY. 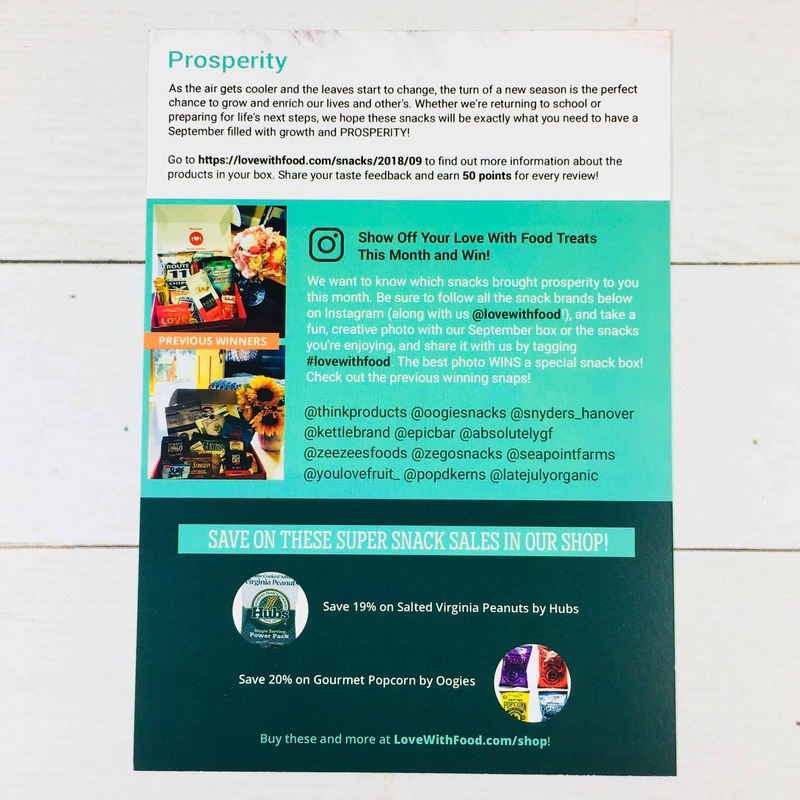 Plus, don’t forget to do a review for 50 points per review and you can get extra savings by shopping at their shop. 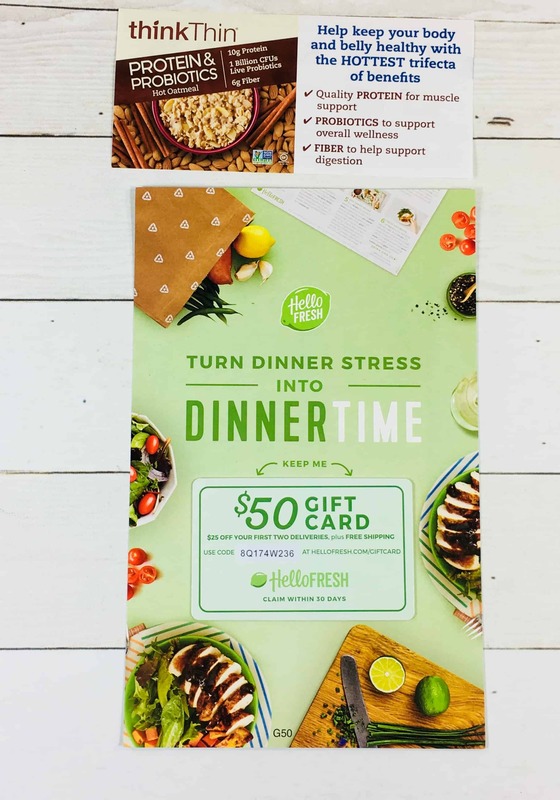 There were a few handouts and coupons in the box. Pop’d Kerns in Sea Salt ($1.20) kind of reminded me of pretzels for some reason. I tried them but worried I would break a tooth but then I’ve had dental work done this year so it’s always on my mind! 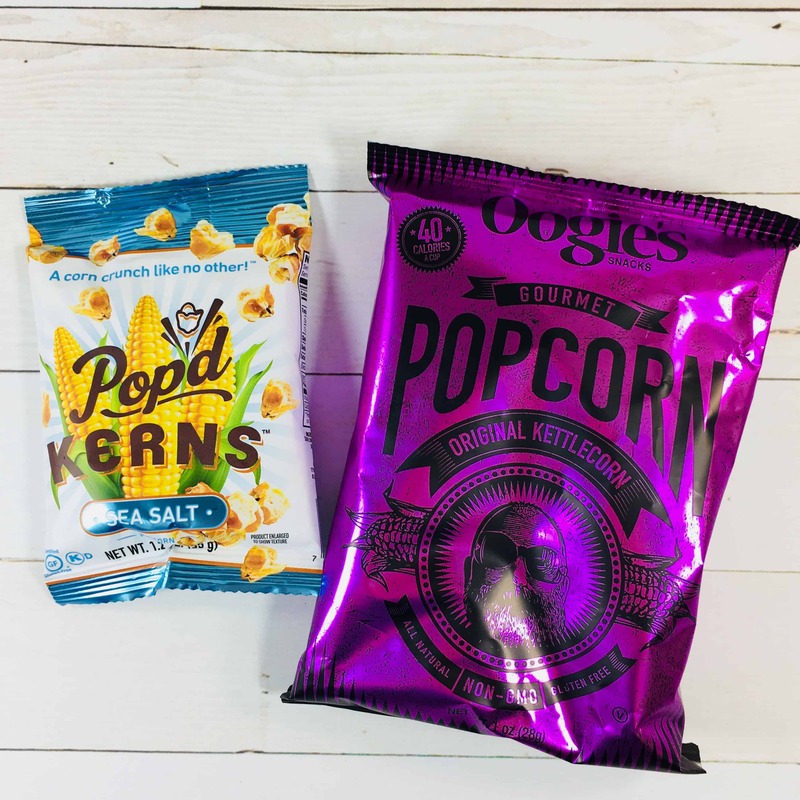 Oogie’s Gourmet Popcorn ($1.17) I like the sweet and salty combo of kettle corn so I look forward to eating this snack, maybe while watching a movie. Popcorn, sugar, oil, and salt are all that’s in here. 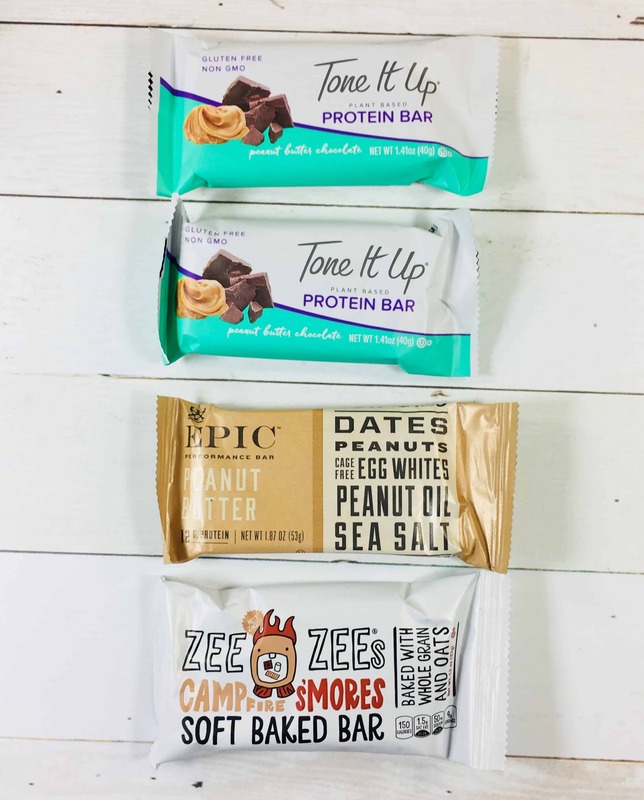 Tone It Up Protein Bar in Peanut Butter Chocolate ($4) Protein bars are handy to have on hand for a snack or meal replacement in a pinch. Pea protein is the first ingredient in here. 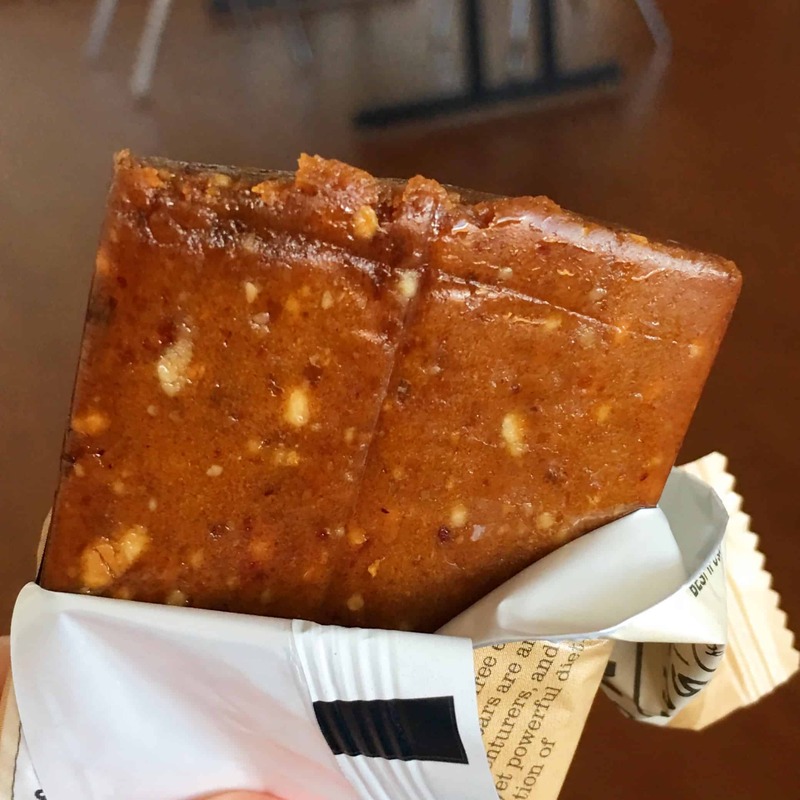 Epic Performance Bar in Peanut Butter ($3.21) reminded me of my beloved LARA bars but were denser, like they would keep me full longer. It was mostly dates, peanuts, egg whites, peanut oil, and salt and was sweet and chewy. Zee Zee’s Campfire S’mores Soft Baked Bar ($1.04) are similar to other soft-baked bars I’ve tried but had a drizzle of chocolate on top. I didn’t really notice any marshmallow. These are marketed towards kids and my daughter liked it a lot. Here’s the protein bar. I’m glad I had it in my tote because I wasn’t feeling hungry at breakfast and didn’t pack much lunch, and then forgot to pack a spoon for my couscous. 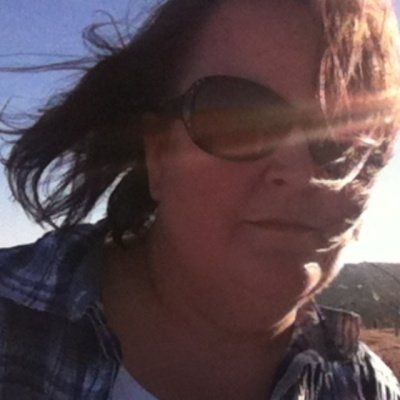 Thank you Tone It Up for saving the day! Here’s a shot of the Epic Performance Bar! Yum! Byrd’s Famous Cookies Georgia Peach Cookies ($1.58) I’ve tried these in various flavors over the past couple of years and they are ok, like shortbread with fruit flavor and a powdered sugar exterior. 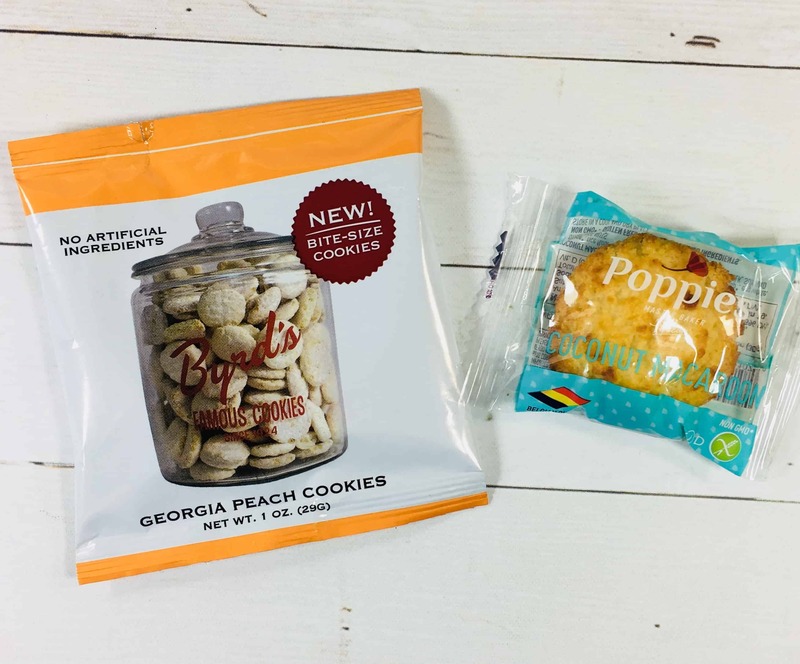 Poppies Coconut Macaroon was made in Belgium and has that classic chewy coconut cookie texture and flavor. You Love Fruit Simply Mango ($1.66) went straight to my daughter, who loves fruit snacks. I feel better about giving her snacks made with 100% mango and 0% added sugar, dye, etc. 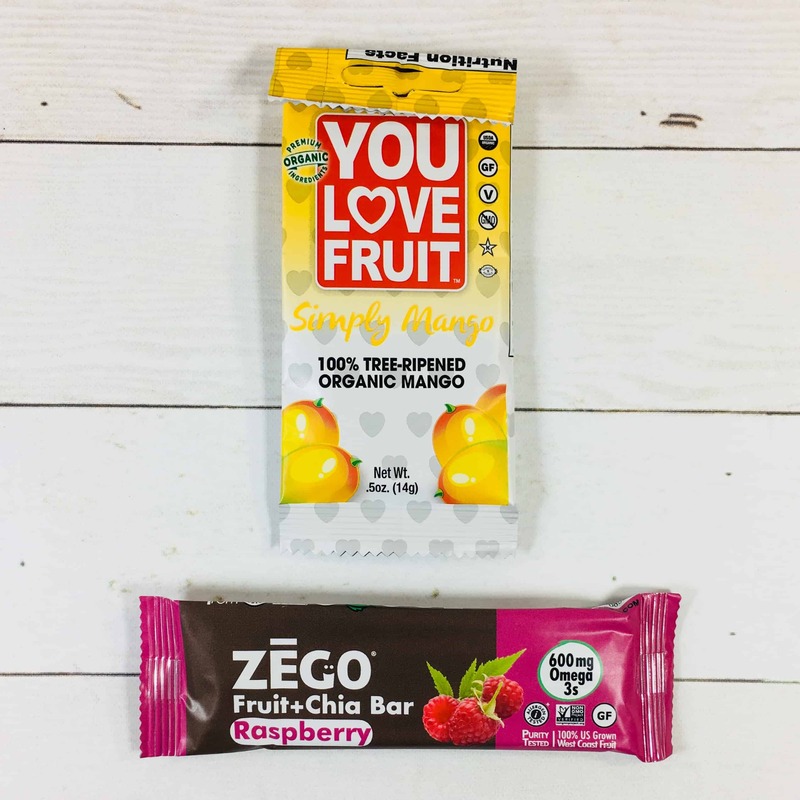 Zego Fruit + Chia Bar in Raspberry ($1.42) was shared and I wish that I had the whole thing to myself. 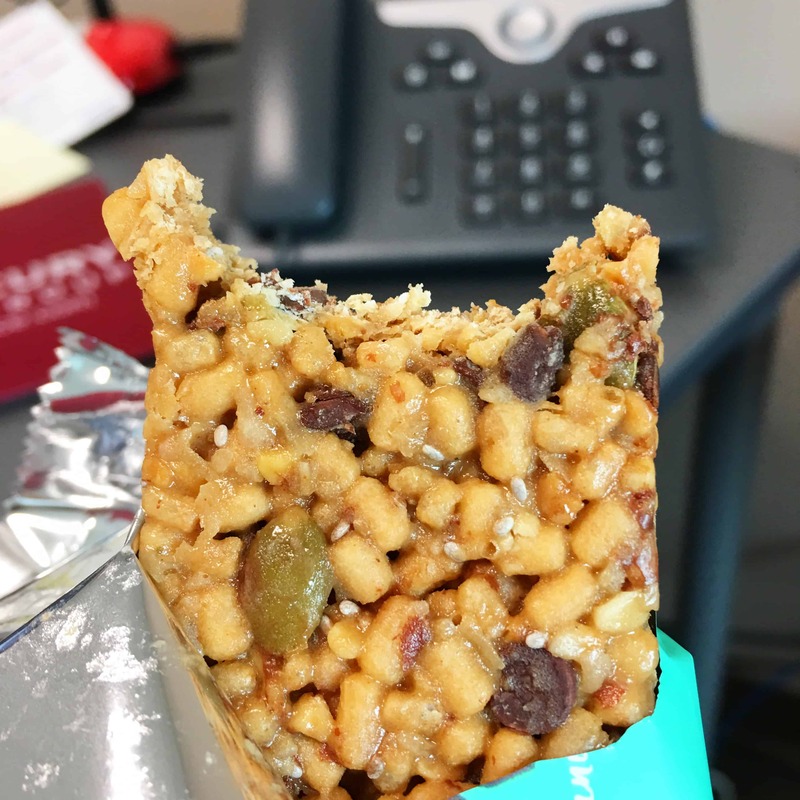 It’s just fruit and chia seeds and the flavor was tangy but the chia seeds added wonderful crunch to this bar. Seapoint Farms Dry Roasted Edamame in Sea Salt ($0.43) I grew up snacking on roasted soybeans so I’m looking forward to seeing how these differ from the classic I’m used to. 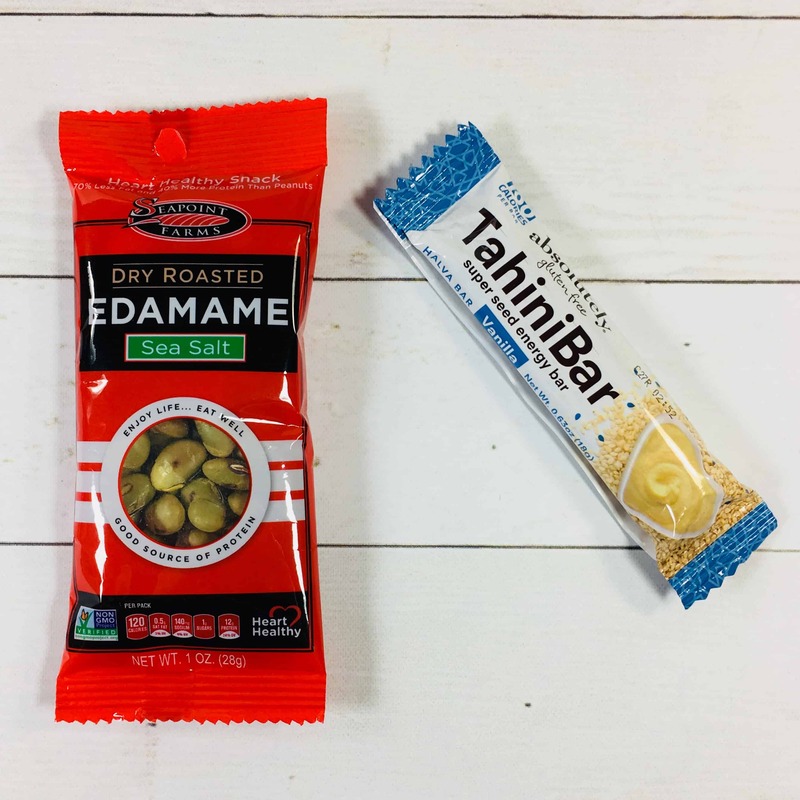 TahiniBar Super Seed Energy Bar ($4.80) is from Israel and in case you didn’t already know, tahini is sesame seed paste and used in hummus. The consistency of this bar was different, kind of crumbly and like biting into powdered sugar. One of the ingredients is a plant used as soap (!) that is also used to make tahini. These were not quite the same as regular roasted soybeans. 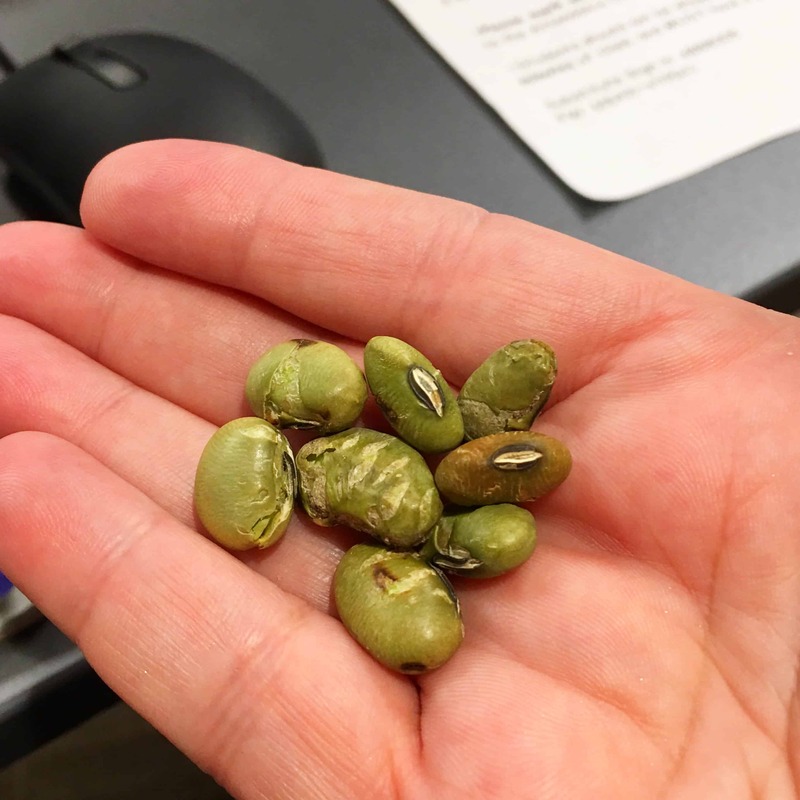 These were more bean-like and less like peanuts to my taste buds. Kettle Potato Chips in Sea Salt & Vinegar ($0.51) My daughter was delighted to throw this in her lunch box to take to school. I’m not a fan but she loves them. 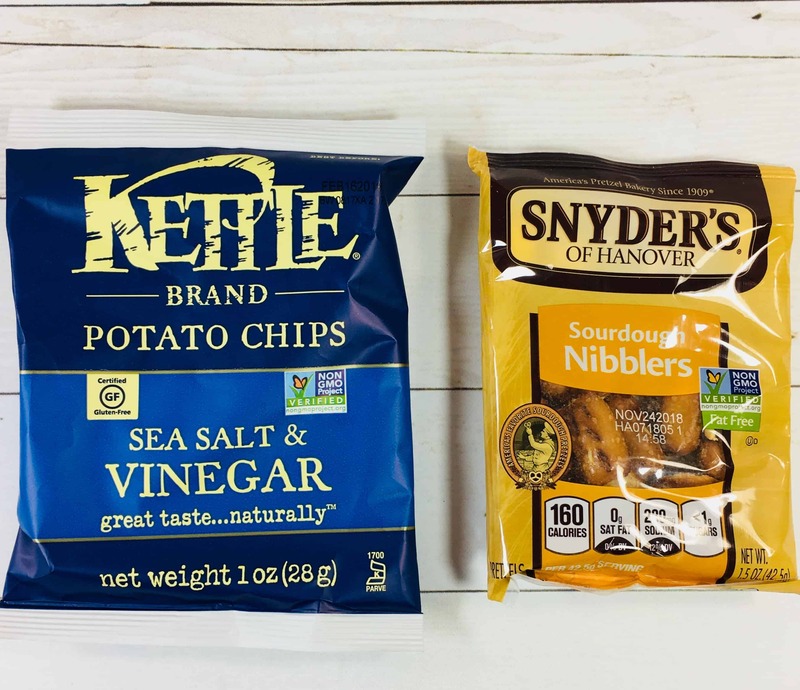 Synder’s Of Hanover Sourdough Nibblers ($1.07) are simply chunks of pretzel and my daughter can carry them as a snack for those long days at school. 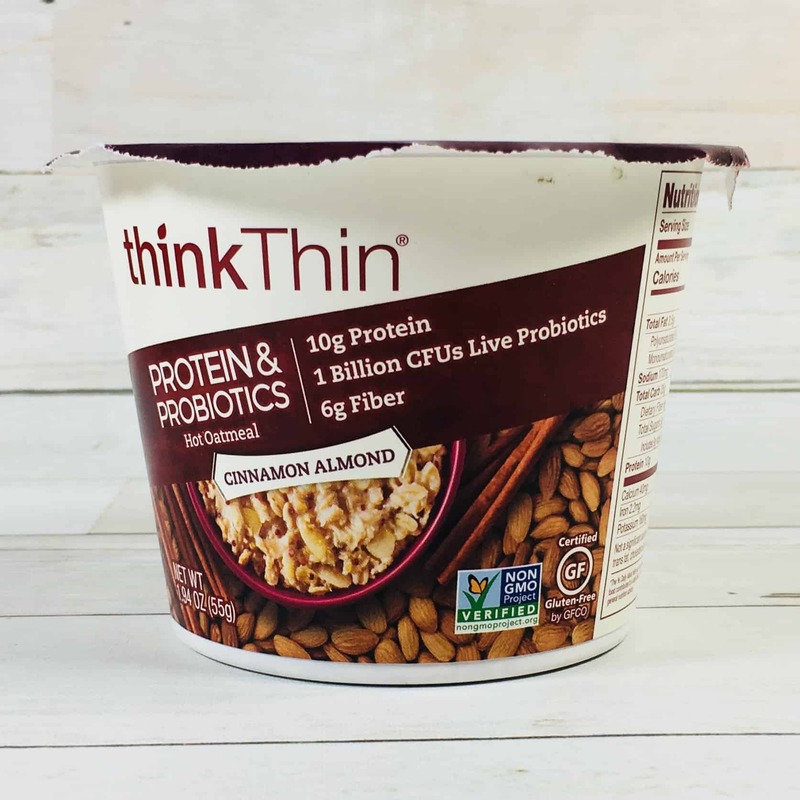 Think Thin Cinnamon Almond Hot Oatmeal ($3.90) I was impressed with the amount of fiber in this instant breakfast item (6 grams) and hope that the probiotics help boost my immune system. 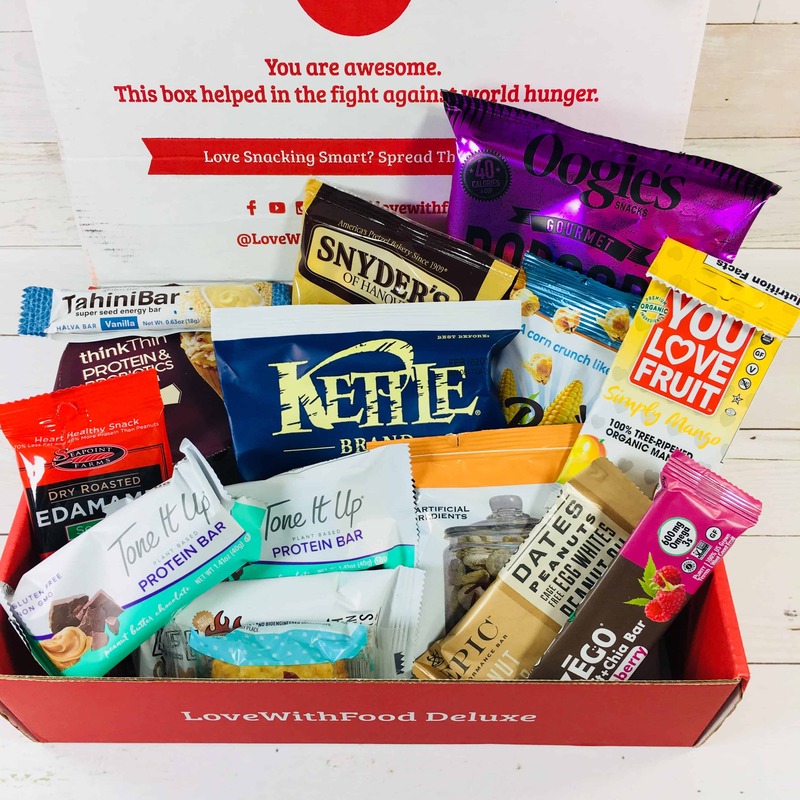 I’m always happy to see Love With Food on my doorstep! 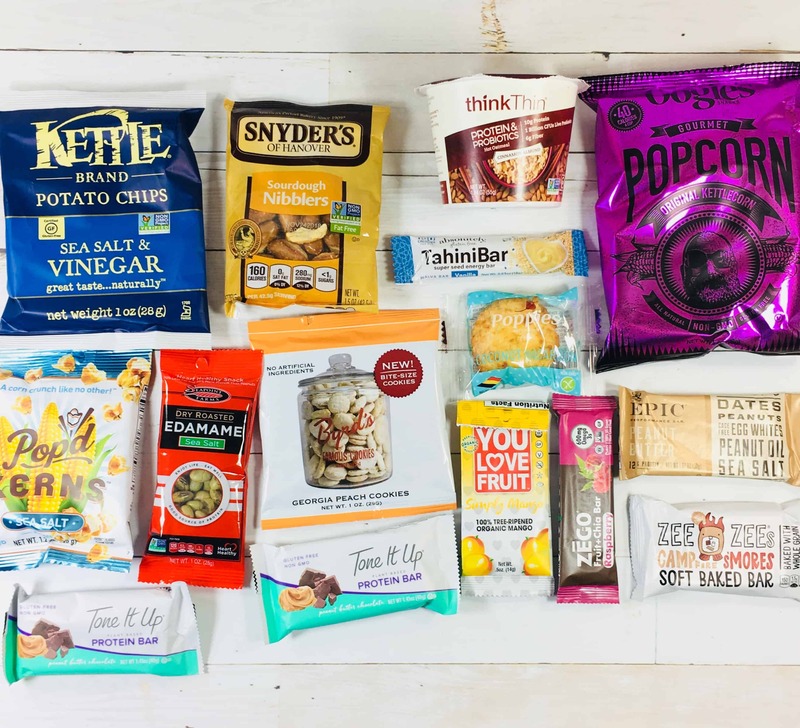 They consistently send products that I’ve never tried before and always have a good combo of sweet, salty, chewy, and crispy. I am glad to see snack bars too since they can stand in for a meal if needed. My favorite part is that they are wrapped and ready to go as I head out the door, plus, I didn’t have to look for money for the vending machine or buy these in bulk online without trying them first. 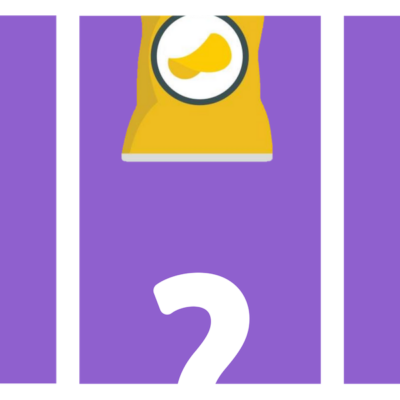 What’s your favorite snack this month? 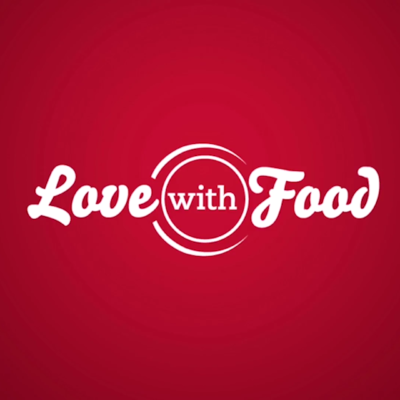 Visit Love with Food to subscribe or find out more!